Today I wanted to tell you about something I did a couple weeks ago. My first real juice cleanse. I have done one day cleanses before but never more than that. This time was a big commitment- I made 18 juices for 3 days. Yes, that’s 6 juices per day for three days. The 6 juices were the same throughout the three days and taken in a particular order. I was not alone in this little venture! My boyfriend, Rhys, did it, too! As well as my best friend Randi and her boyfriend, Andrew, and my mom did it also. 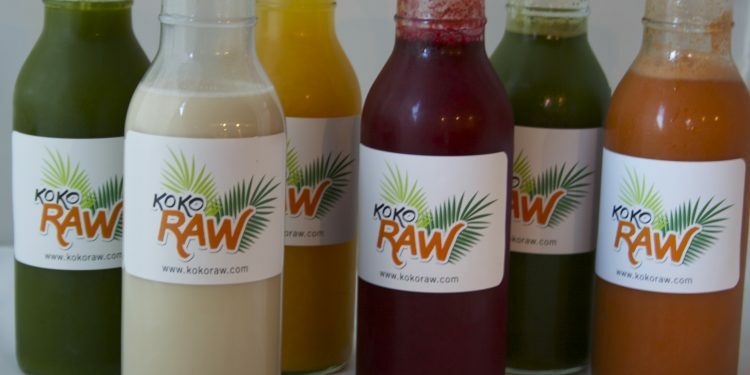 Now, I make these juices from my company KokoRaw. Unfortunately, my website isn’t up yet but I sell my granola here through Koko’s Kitchen, and I will be offering the 3 day juice cleanse as well. The juices are absolutely delicious, and you can approach this cleanse any way that you feel comfortable. I actually don’t even like using the word cleanse. This isn’t a quick way to lose weight. This is a way to reset your body and to let it begin telling you all the things it wants to about your dietary and lifestyle choices. 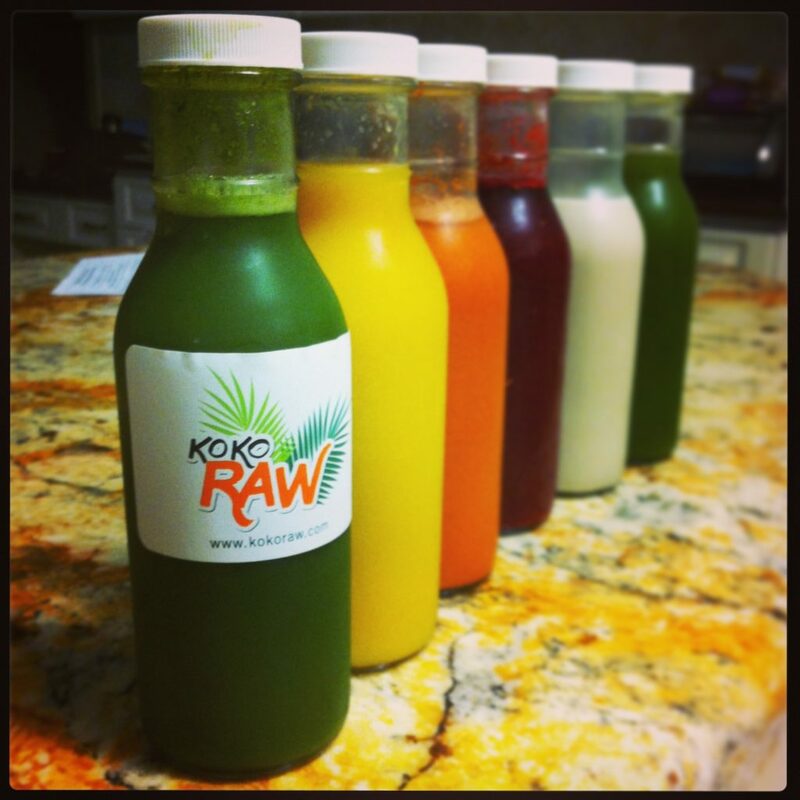 I’ve learned so much from just one 3-day cleanse, but more on that later…. It’s your choice throughout the cleanse whether you want to abstain from eating completely, or whether you want to enjoy raw foods, or just fruit and veggies, or even if you want to continue eating 3 meals a day and supplementing with juices for a boost of nourishment. I really want this cleanse to be available to everybody, and the most important thing is trust your body. If you are really struggling, then eat, I say! Juicing shouldn’t have to be an all or nothing thing, but if you do build up to a 3 day (or longer!) cleanse, you may be very pleased with the results. First, the juice! Each day I woke up and enjoyed a deliciously invigorating kale, lemon, ginger, and apple juice. A few hours later, I would get a burst of energy and lovely citrus from my grapefruit, lemon, orange, and coconut water juice. Around lunch time, a satisfying carrot, lemon, lime, and apple juice which made me not miss lunch at all! Juice number four was a deeply focusing beet, carrot, parsley, ginger, orange juice. Juice five was a serious treat- a rich vanilla almond milk sweetened with dates. This was the “juice” I looked forward to throughout the cleanse for some sweetness and some protein. The last juice of the day was back to the greens with kale, pineapple, cucumber, parsley, and coconut water. I also drank herbal tea, and I kind of would recommend a cleansing tea to help you clean out your system if ya know what I mean. Now onto how I felt during and after the cleanse. After drinking my first green juice in the morning of day one, I felt highly energized. I went to work and felt absolutely great throughout the morning and with my 2nd juice. When my break rolled around and it was time for lunch, my stomach was grumbling a bit. But a few sips into my 3rd juice, I felt refreshed and perfectly fine again. I felt much calmer than usual. I am quite enthusiastic and excitable, but throughout the cleanse I have never felt calmer. I also felt no need to be anything but true to myself and the way I felt. Juice 4 was taken on the drive home from work. It was just what I needed to tide me over, as the beet juice feels heavier than the other juices which is perfect for an early dinner time. I was starting to really get hungry in the evening when there wasn’t the distraction of working, and I was just relaxing and literally all I could think about was FOOD. I was craving things that I don’t even normally eat! My stomach was makin’ some straight up cray sounds. But I could tell it was strictly all in my head and that my body was doing A-OK without food. I really wanted to hold out though so I finished my favourite juice five and juice 6 and went to bed. I slept extremely well throughout the juice cleanse which is rare for me. I either struggle for ages trying to get to sleep or wake up during the night and take forever to get back to sleep. I woke up on day two feeling awesome. That’s all there is to it- I felt amazing. I was wide awake from the second my eyes opened and felt so full of energy! Mid-day my energy started to dwindle and I had a bit of a dull headache. I was unable to do things as fast as I usually do and it all felt a bit dream-like. The absolute hardest part of the entire cleanse was the evening of Day 2. I went to the Paramore concert (which was soooooo good!!) and I was absolutely starving. Rhys was too. We were really struggling, and a lot of people around us had popcorn. It took all I had not to steal their popcorn 😉 But we made it and each had a green juice in the car on the way home which pretty much saved us! One thing that Rhys and I both noticed was the instant gratification you get from juice. The very second you start drinking one you are perked up with energy and you can feel it’s vibration in your body. This doesn’t happen with regular standard american diet (SAD) food. And if you do get that instant boost from energy drinks or caffeine, you’re going to feel like crap soon after! Day three was the home stretch- easy peasy man! I woke up once again feeling insanely amazing…this never changed throughout the cleanse. I have never felt better upon waking. I was a bit slow throughout the day again, and felt like I was a bit drunk. Which is totally weird but it was like I had a slight buzz going on or something in my head. In late afternoon, I started to feel slightly nauseous and I didn’t want to drink my remaining two juices. I no longer felt like consuming anything. I think if I had decided to continue my cleanse, I could have done it. It was as if my body was finally used to not having food. Next cleanse, if I feel this again, I will continue on with it. But, this particular cleanse I had a solid plan for just three days of juicing, and I didn’t want to push it too hard on my first extended cleanse. I actually skipped my last juice (which Rhys happily took!) and funnily enough, I found out that my best friend didn’t finish her last juice either! Rhys and I broke the fast with a piece of fruit. It’s important to come out of a fast with light foods. For example, I had fruit, and then a smoothie, and then a raw salad. When we did start eating regular foods again, it was as if we were awakened to their effects on us. For example, the first time I had a coffee after the cleanse, my heart started racing to the point it was uncomfortable. I have never had that before, and I haven’t had a coffee since…except for my favourite GanoLife red reishi infused coffee- it just doesn’t have that effect! The first time I had something sugary…which happened to be a gluten free, vegan oreo cookie on top of coconut milk ice cream, I crashed hard! I didn’t even get a sugar rush, I just literally started to sleep as soon as I finished. I tried to keep my eyes open but I was fighting them, and they were winning! This whole experience was so eye-opening, and I look forward to cleansing regularly for the rest of my life. The entire spiritual side of cleansing interests me, as well. I paid much attention to how I felt spiritually and how in tune I felt with my body before vs after. I look forward to revisiting these things and discovering an even deeper connection in the future with longer cleanses. I should mention that I didn’t work out at all during the cleanse and I suggest that you do not workout either. If you are going to do a cleanse or fast, check with your doctor first. If you have any questions about my juice cleanse or juicing in general, feel free to ask. I will do my best to answer! Have you ever strictly juiced or fasted before? 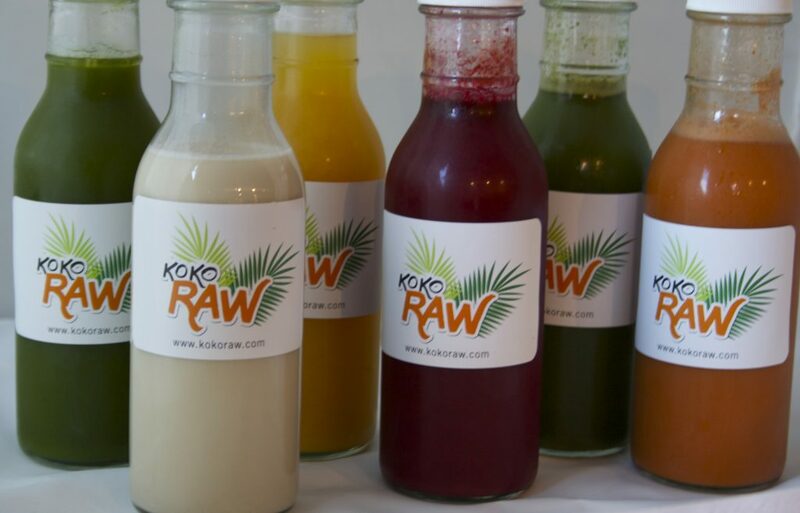 Are you local and interested in the KokoRaw Cleanse, please e-mail me at [email protected] to discuss further.